The most beautiful, touching novel ever written about Canada geese! Jessica and her gander, Cessna. My name is Jessica Tarpley and I'm from Maryland in the U.S. 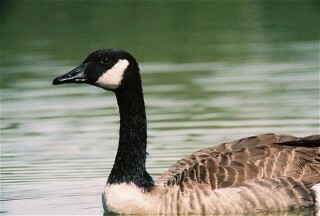 I've spent many years studying birds, and waterfowl (geese in particular). I fell in love with Canada geese nearly 13 years ago (when I was 9) when I found an injured gosling that had been torn open by a cat. Two large gaping wounds revealed the internal organs. I took the bird home and sutured him. It wasn't but days that the 3 week old gosling started following me around everywhere and snuggling up in my lap. I've been in love since. I'm now in college studying the biological sciences (to put it very broadly). It was two years ago, during a noreaster, 2 feet of snow, and I had to drag myself in all the way down to the lake to feed my geese. Well I fed my geese, but all the wild ones wanted to be fed, too, so I fed as many as I could. All of them were crowded around and so many in my lap I couldn't stand back up. They were starving pretty badly because under nornal circumstances, they would not do this. They were all over me, even birds that would normally take off if I got within 50ft of them. 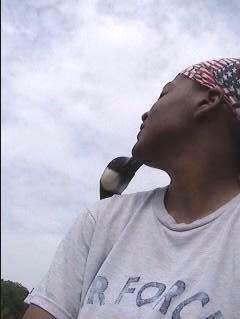 Anyway, after I was done feeding them and most had flown back to the open space in the lake (that was the other interesting thing, most came flying up), one goose turned and came back up to me. 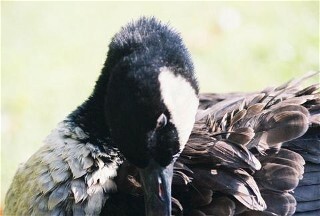 I actually recognized this old gander, I hadn't seen him in years, but I remembered him. He is an "elder" on the lake. I was glad to see he's still around. After he'd finished looking for any crumbles that may have been left, he slowly walked up to me and stumbled, in a typical goose fashion, into my lap and came right up against my chest and put his neck over my shoulder and against my neck, the same way one of my pets would, then just simply turned, climbed down and walked back on to the lake. There was no hesitation, no pause, no looking around for more food. He just walked right up to me, climb into my lap and put his neck over me. The only pause was when he put his neck over my shoulder. I will never forget that. I thought maybe he was looking for more food, but the way he did it; I realized, and know that wasn't the case. I know because my pet geese perform this same behavior all the time, but I've never had this happen with a wild goose before. I haven't seen the old gander since, but I know he's around. It's not unsual for several years to go by before I seem him again.